It is that special time of year again in San Diego, Ski season! Unfortunately downhill skiing is a sport that places the participant at risk of ACL and meniscus tears. The phantom foot injury mechanism is the most frequent source of knee injuries with skiers. 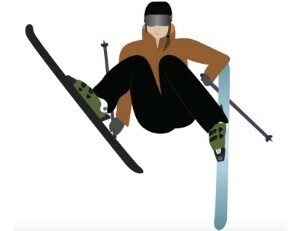 This occurs when a skier is off balance and sits too far backwards. The deep knee flexion (bend) results in the hip placement being below the knees. The upper body is facing the down hill ski. The uphill ski is unweighted while the remainder of the weight is placed on the downhill ski and the uphill arms is placed backwards. This results in a sudden internal rotation (inward rotation) of the hyperflexed (bent) knee, resulting in injury. Although you cannot eliminate the risk of injury with skiing and other sports you can minimize it. Research suggests that ACL and other traumatic knee injuries can be reduced by more than 50% by using a preventive training program that combines flexibility, balance, strength, plyometric, agility, and sport specific training. So before you hit the slopes this year consider consulting a professional who can evaluate your strength, flexibility, and proprioception (balance) and give you a specialized program to minimize your risk of injury.